Has this happened to you? You set goals at the New Year and then 4-6-8 weeks later, it's just a note on a piece of paper in a desk drawer. How do we get those goals to transfer off paper, into action and then stick around for a new outcome? In today's episode, Mindy Irish has 3 powerful tips to making goals stick and helping you with a new start to 2018! I think you'll find them simple and useful, yet challenging. Mindy is a repeat guest who has a powerful story of life change. I had a conversation with her this past summer where she went into detail about her journey. The title of those episodes were called Chase Your Optimal (part 1) and Chase Your Optimal (part 2). Be sure to check them out! With that said, I hope you enjoy this conversation and feel inspired! I'm excited for you to hear part 2 of my conversation with Adam Parsons. In today's episode, he expands further on how young people can cultivate endurance when it comes to their strengths and talents. He also gives some great tips on how creative-type individuals can be true to their craft and make a living at the same time. Adam is the founder of MOLD, which is a branding company. He has written The Valley of Rhyme, a children's nursery rhyme book. Currently, he is in the process of writing The Times of Rhymes and chronicling his endeavor through a documentary. He is an illustrator, a poet, and a creative genius. When I met Adam Parsons, I was immediately impressed on so many levels. He is in that small category of people who are highly creative yet incredibly disciplined and committed to his craft. He does not simply talk about ideas, he puts his ideas into the practical everyday. Have you heard the phrase, "to truly become great at something, you need to put in 10,000 hours?" Well, this guy has done that and more when it comes to his art. Adam has created thousands of pieces of art dating back to his teen years. And most of his art has never been seen. I've seen some of those pieces, and let's just say....they are good (understatement). Adam has often told me that he HAS to create art. For him, creating art is the same as oxygen is to humans. It's his passion. In addition, Adam is the founder of MOLD, which is a branding company. He has written The Valley of Rhyme, a children's nursery rhyme book. Currently, he is in the process of writing The Times of Rhymes and chronicling his endeavor through a documentary. That should be good! He is an illustrator, a poet, and a creative genius. 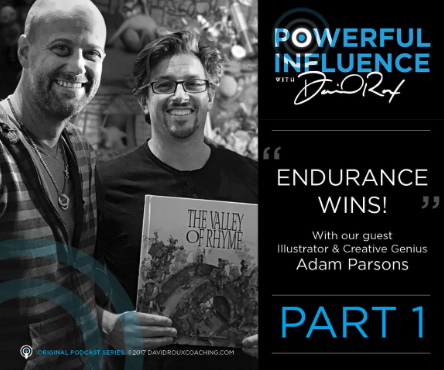 If Adam could speak to young people today, his message would be: Endurance Wins! Listen as he explains what he means by this phrase. It's really good! Balance. It's a tough thing to accomplish in life, especially when it comes to helping our teens develop independence. The question we often ask ourselves is, "when should I step in to help my teen, and when should I simply let them figure it out?" 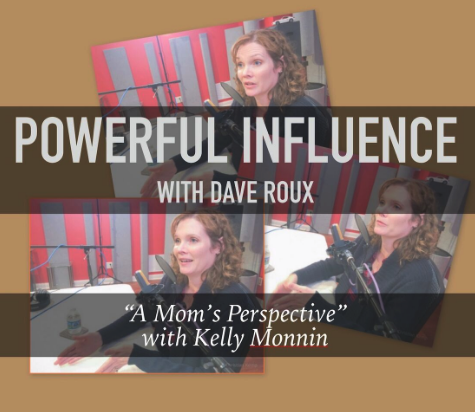 I'm excited for you to hear my continued conversation with Kelly Monnin, a mom of four who is very involved with her kids, the community, and the school system. Kelly shares some good tips when it comes to this balancing act. In addition, she also shares some ideas that help our teens develop some life skills. I really think you will appreciate her practical insight.